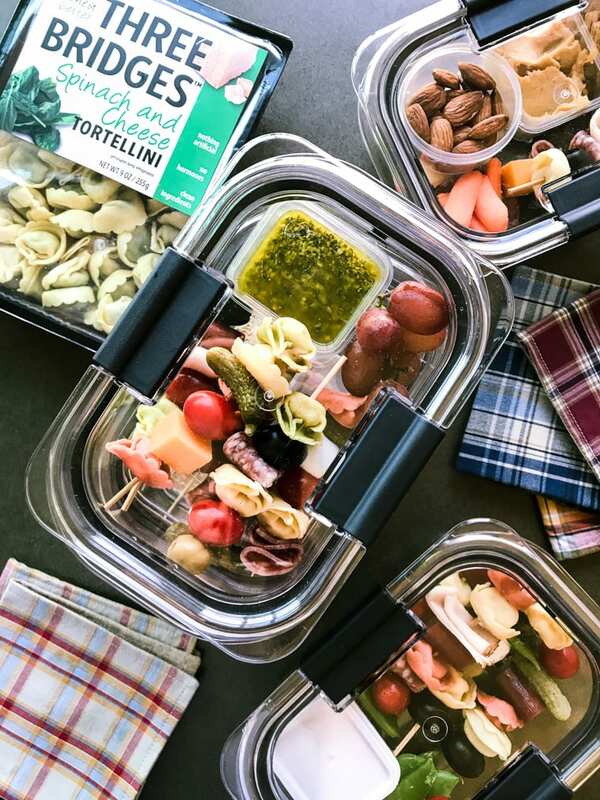 Easy Lunch Prep Protein Boxes with Three Bridges Tortellini ~ these energy packed protein bistro boxes made with mini tortellini skewers will set you up for healthy lunches and snacking! 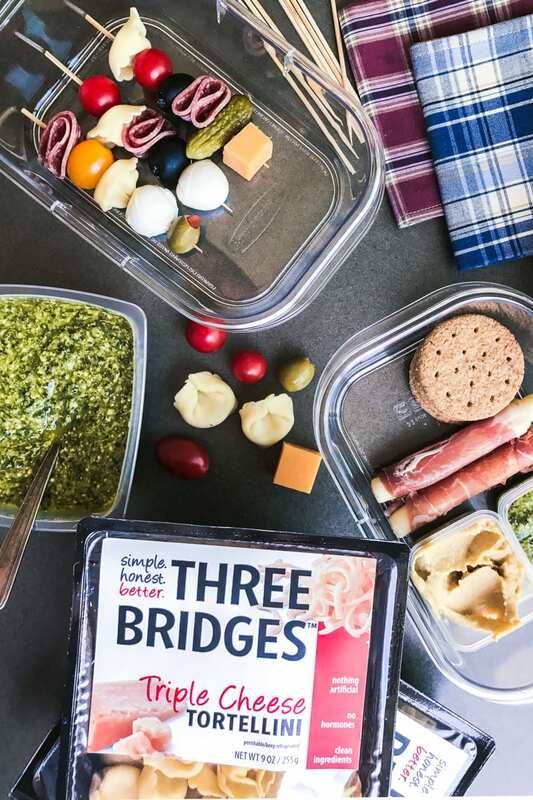 *Today I’m teaming up with Three Bridges™ ~ their line of fresh refrigerated pastas and sauces are made in small batches from premium, wholesome ingredients without preservatives, antibiotics, or hormones. The brand makes clean eating a little bit easier for all of us with simple, honest, and better-for-you products. Lunch has never been my strong suit, and I struggle with mid-day hunger a lot. I mean, I get downright hangry, and that’s never a good thing. Once you’ve gotten all the way to hangry, you need to grab something. Fast. 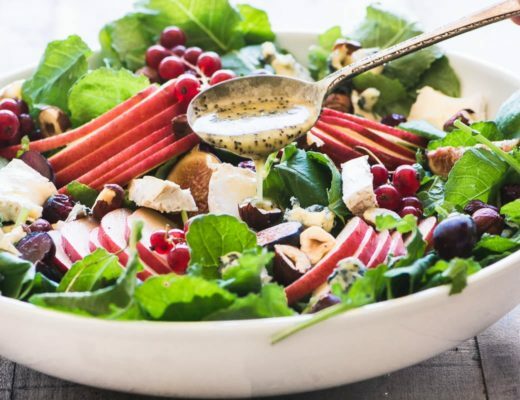 You can stick a spoon in a peanut butter jar, cut off a chunk of leftover Brie, or you can get smart and do some lunch prep! That’s where Three Bridges comes in. Their line of fresh pastas has turned me into a lunch prep ninja. The base for my lunch (or snack!) boxes here is their Triple Cheese Tortellini. These plump little filled pastas are virtual protein bombs, with up to 14 grams per serving, and the real food ingredient list is a pleasure to read ~ you can offer it to your family with confidence. TIP: Wonder whether a particular brand or product is healthy? Read the label. If the ingredients are whole foods that you can pronounce, it’s a pretty good indication that it’s good for you. I like to make colorful little skewers for my lunch prep boxes. With back to school season in full swing, these are perfect for kids lunches! I take long toothpicks and alternate the tortellini with yummy tidbits like olives, cold cuts, cherry tomatoes, etc. 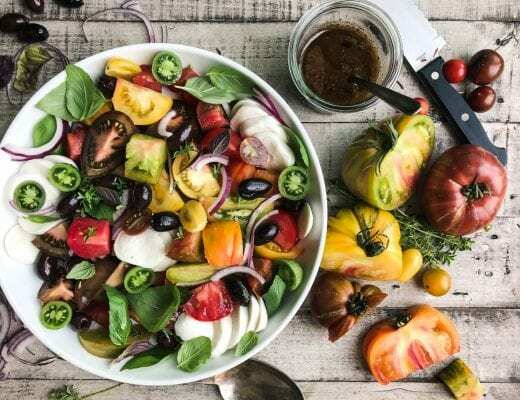 Three or four of these skewers makes a satisfying and healthy lunch, and you can stack them up with whatever you like. Did you know tortellini is also called ombelico (or belly buttons) in Italy? I add extras like crackers, baby carrots, grapes…whatever I have around. 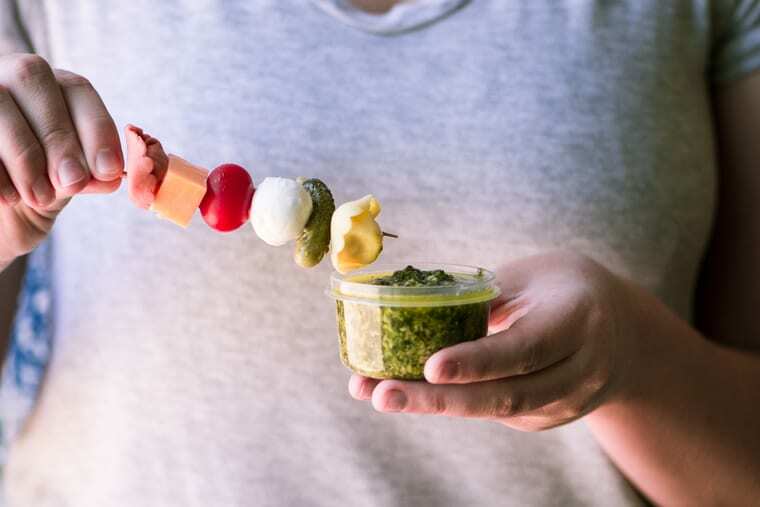 And then I’ll pack up little containers of dipping sauce for the skewers…I love Three Bridges Pesto Sauces, they make a classic Basil Pesto Sauce and also a delicious Kale Pesto Sauce, and they’re fresh, which makes all the difference. 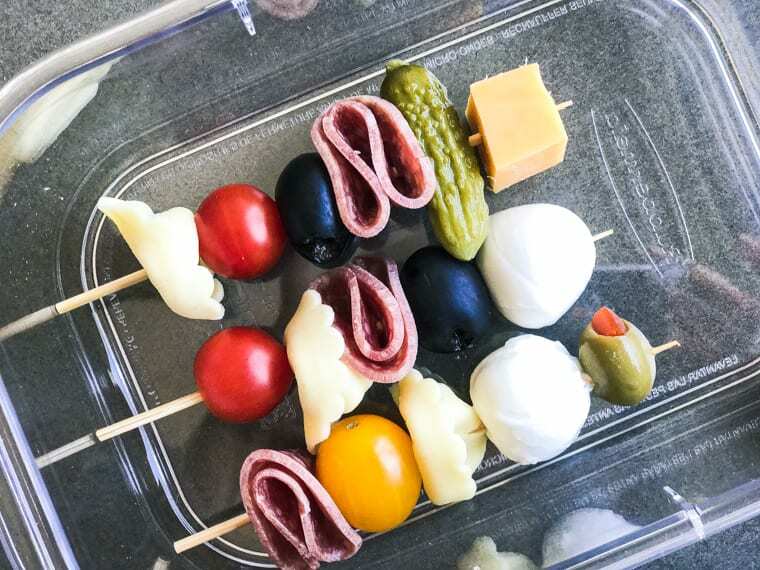 TIP: If you’re making lunch boxes for kids to take to school, snip off the pointed end of your toothpicks or skewers after you’ve threaded them. I’ve got lunch for the week ~ take that, hangry! 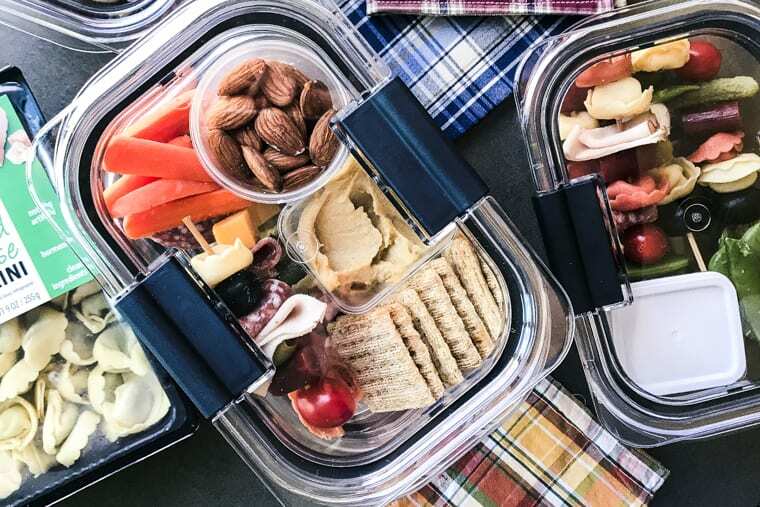 TIP: Go ‘green’ and ditch your paper lunch bags, baggies, and napkins in favor of plastic or glass storage boxes and cloth napkins. My plaid cotton napkins are made from recycled men’s shirts! 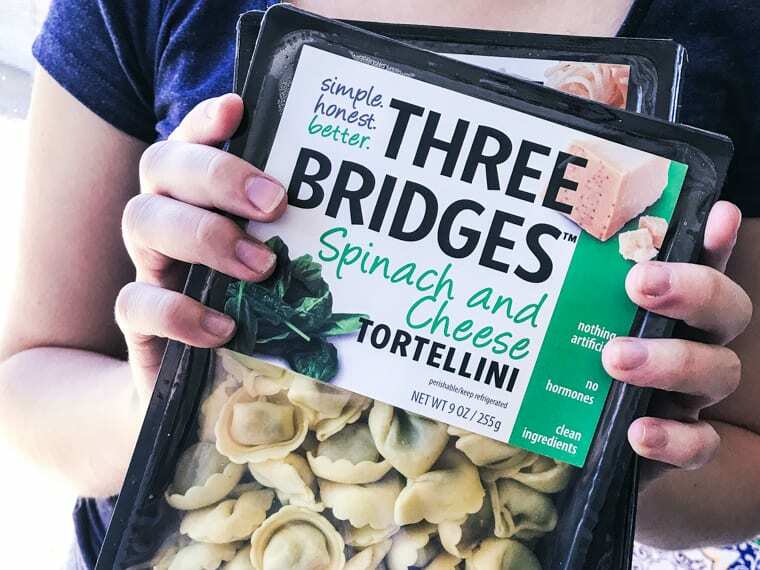 Looking for other delicious ways to use your Three Bridges tortellini? I recommend my TORTELLINI SALAD, but there are lots of great recipes out there, like this Tortellini with Italian Sausage, or this Creamy Tortellini Soup ~ yum! Serve these skewers as a colorful appetizer, and don’t forget the dipping sauces. Don’t forget to pin these easy protein packed lunch prep boxes! Where did you get the actual lunch boxes? They are so cute and has plenty of space! Those are just Rubbermaid, Kim, it’s their new Brilliance line of storage boxes, you can find them here. My boys love tortellini! You’ve given me some great ideas! I definitely need a stash of these for my lunches and snacks! Such a nice change from my go-to lunch options! This is great, Sue! I actually packed tortellini soup for my daughter’s lunch today, but on days when it’s a little too hot for soup, this is a fabulous idea that I know she’ll love! Thank you! Such a wonderful idea Sue – and you are right, those afternoon trips to the refrigerator don’t do me any good! Sharing with my daughter so she can make these for grandson Isaac :) He would love it! This is such a clever idea! I love it! My only hesitation is eating tortellini cold.. I’ve never done that! Do you like it better cold or warm? I’m always on the hunt for a lunch I don’t have to heat up! I love it both ways, and if you’ve ever had a tortellini pasta salad you’ll know how it is cold. I think it’s a great way to get an easy shot of protein and energy without resorting to empty carbs. Preparing and planning our meals ahead of time will make healthy choices a fuss-free and a no-brainer. Thank goodness various sneaky tricks can help to make assembling meals a cinch if you’re intimidated by cooking. I’m going to whip up my favorite plastic container and get this started. Thanks for the ideas. I’ve been looking for a good pesto, I used to buy the one at Trader Joes but I moved…then I tried one from a jar and I couldn’t believe how bad it was! You’ll love this one, Rachel, and it’s readily available in regular supermarkets…I couldn’t believe how bright and fresh it was, and stayed, for days in the fridge. These are some great lunch box ideas, Sue. What a wonderful idea! 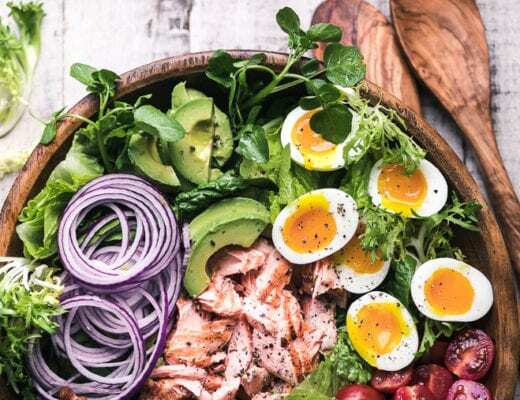 I always struggle with finding decent healthy lunches for the grandkids – this is perfect! And that pasta sounds wonderful. I love that it’s so high in protein, not the norm for pasta! 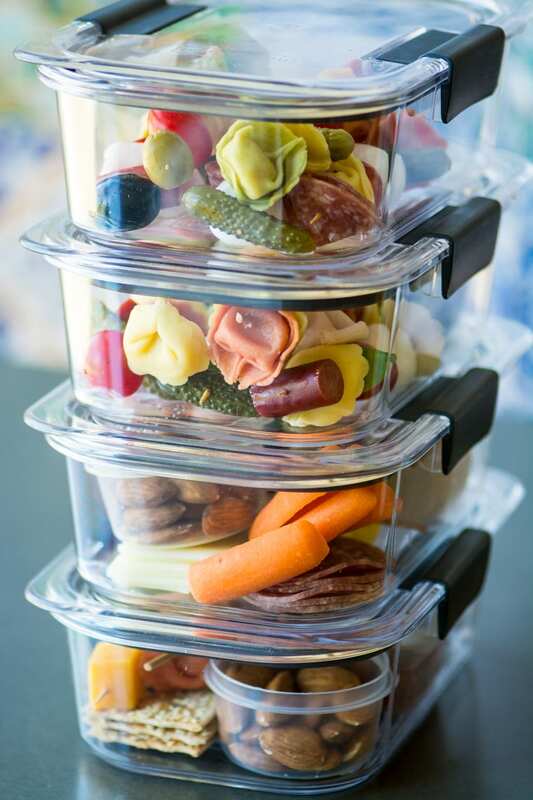 Thanks Chris, and I agree, great for kids…I wish I had this idea when my girls were in school, I can’t tell you how many ‘LUNCHABLES’ came home uneaten! What is the brand name of the containers you used! They are lovely too! They’re Rubbermaid, Carol, they have a new line out called “Brilliance”, I love them. There’s a link to them in the post. You can find them HERE. Woah! Those are such fun lunch boxes!!!! Absolutely love Tortellini! Three Bridges does make gluten free ravioli Sarah, and I’ve tried it, it’s great! Love this idea and I know my hubby will too! I pack his lunch every morning and after awhile a sandwich is pretty boring. THIS up’s the lunchtime game. Love it!! !